People have an intention to get the best product. This is applicable for coffee machine too. But as there are a lot of coffee machines available on the market with various features and abilities, it’s a kind of hard to choose the best one simply. It needs homework on choosing the best coffee machine before getting one. But it needs time and effort. And in this situation, we’ve decided to do the homework for you so that you can save your valuable time. Hey there, let us introduce one of the best automatic coffee maker, the iconic Cuisinart DGB900BC. This Cuisinart automatic coffee maker comes with an attractive look. The black plastic and the brushed steel accents have made this appliance pretty beautiful. The shiny skin of the coffee maker is not only attractive, but also increases the beauty of your kitchen decoration. The black sleek design is just awesome and we assume you’ll also love it. Basically, this is the perfect combination of a multi-purpose coffee maker. The grinder is placed at the top of the machine and in the bottom, the carafe is placed nicely. There is no doubt that the Cuisinart DGB-900BC has an awesome look. The dimension of this appliance is 7.9x12.7x15.9 inch and the weight is about 15 pounds. It’s a pretty compact and ideal size for a coffee maker. The Cuisinart DGB-900BC automatic coffee maker comes with a built-in charcoal water filter system. The anti-chlorine action of this system will provide you a coffee with more delicate flavor. Actually, a great coffee comes from good water. And the charcoal water filter system refines the water. The filter lasts for 60 pots 2 months. And that filter is easily replaceable. The use of this charcoal water filter is an optional part. You may either use it or not, it all depends on your wish as this is not required to brew the coffee. You can also remove the filter from the reservoir if you want. This Cuisinart automatic coffee maker comes with the permanent Gold Tone coffee filter. You can easily access and remove the machine. Push the release lever for the lid located which is housed on the left side. You can remove the filter for cleaning purpose too. And the most amazing part is, you can use either the included Gold Tone coffee filter or the paper filter. It depends on your choice. Use the one which you prefer most and enjoy the coffee. The built-in conical burr grinder of the Cuisinart automatic coffee maker grinds the coffee beans consistently so that you can have the best taste of coffee without an additional mess. 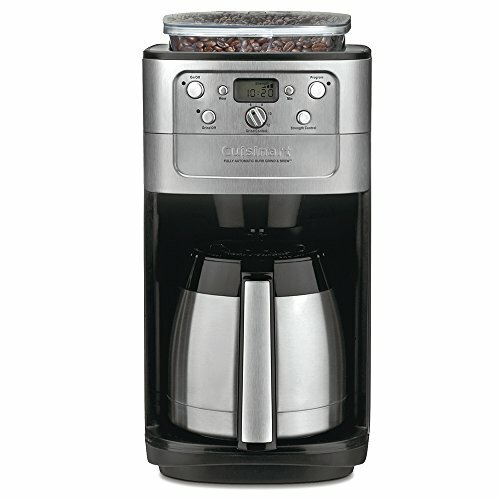 This burr grinder is one of the best features of the Cuisinart DGB-900BC and it’s far better than the blade grinder. The grinding chamber has protection of see-through plastic lid and it gives access to the chamber by lifting on the top. You can access the chamber and fill with your favorite coffee beans. The Cuisinart recommends to remove the grinding chamber and rinse after every use. You may also use pre-ground coffee. Just disable the automatic grinding with the button on the control panel. The Cuisinart automatic grind and brew thermal offers a digital clock and timer control that allows 24 hours fully programmable brewing and grinding. You can program the machine for grinding the coffee beans and brewing the coffee in advance. You can set the program at night so that you can wake up in the morning with a wonderful cup of coffee. Just put the water in the reservoir, place the coffee beans into the grinder and the set the timer. The automatic function will take the coffee beans from the pot and grind it. Then it’ll take the water and prepare a wonderful coffee for you. It will make and wait for you to serve the coffee. Additionally, you can also program the machine form one hour to four hours’ increment. And the easily accessible basket filter is another great addition to the machine. On the other hand, the machine shuts off automatically once the brewing is done. You can set the machine to make the coffee between 2-4 cups. The brewer of the coffee machine ensures the taste like a full pot of coffee. The machine will heat the coffee 2 times if it needs. Additionally, you can have different strength of coffee. The machine offers three different strength-based coffee flavors, mild, medium and strong. You can choose easily what you need. And the machine brews the coffee at the optimal temperature that brews the coffee quickly and ensures the good taste. The Cuisinart DGB-900BC offers the brew pause system. This automatic coffee maker allows you to remove the carafe during the mid-brew if you need instant coffee and can’t wait for the full pot. And when the carafe is removed, the filter basket automatically stops the coffee flow for up to 30 seconds without dropping. And the automatic system resumes it again once the carafe is replaced. The double wall insulated thermal carafe provides the best coffee. The Cuisinart DGB-900BC automatic grind and brew thermal coffee maker comes with water filter, coffee scoop, Gold Tone permanent coffee basket, 12-cup stainless thermal carafe, instruction manual. And the coffee bean holder of the machine can hold up to half a pound of coffee for grinding. 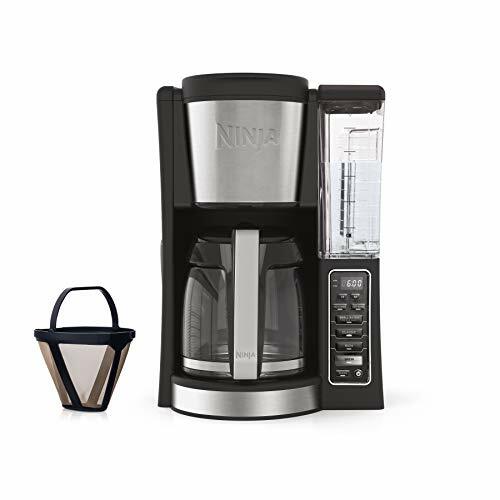 This model of the coffee maker is built to suit almost any kind of kitchen design. The classic finish of the coffee maker has made this machine a higher quality appliance. This BPA free, grind-off feature based coffee maker is totally worth of money. Though this coffee maker is one of the best automatic coffee makers in the market but it has some weak sides too. For example, the carafe of this coffee maker isn’t dishwater safe. So, you have to be careful while cleaning the coffee maker. On the other hand, the water tank of the machine is tricky to fill without spilling. Actually, no product is perfect in this world. Therefore, this item has some minor limitation that won’t make a major issue. We hope, you’ll be satisfied with this automatic coffee maker. 1. Does the machine shut off automatically after brewing the coffee? - Yes, it does. The machine has an automatic function. 2. Can I use pre-grinded coffee? -Of course, you can. Just turn off the grinding function from the control. 3. What type of filter does the coffee maker use? -Basically, the coffee maker comes with the permanent Gold Tone coffee filter. But it also allows you to use a paper filter. Use the filter whichever you want. 4. Does the machine make coffee directly from coffee beans? -Yes, it does. The grinder of the top of the machine grinds the coffee beans and the brewer brews the coffee. 5. What is the capacity of the coffee bean holder? -The coffee bean holder can hold up to half pounds of coffee bean for grinding. So, here we are! In this article, we’ve tried to bring every single detail to the light of the Cuisinart brew and grind thermal. Hope we did our job well. In this in-depth review, we discussed both the good and the bad side of this automatic ﻿﻿coffee maker. And we assume that you’ll be able to decide with the help of our article if this coffee maker would be the best for you or not. We did our job and now it’s your turn. The final decision depends on you but we suggest this coffee maker as it’s a pretty good brewer-grinder. If you have any further question to know then just let us know by commenting below. Hope, we’ll get back to you soon with proper information. Good luck!